It took some years before I finaly decided to go into Open Sim. Well here i am and from today you can find my products at Kitely Market. For the ones that know me from Second Life as well as Inworldz I don't need to explain what I create . For the others,... you will see! SHOPITY HOUSES & SUCH which stands for houses, shops, clubs, bars and pubs. I love to build in themes. Mainly Mediterranean, but I have also a range of shops that are related to RL shops you find in Charleston NC. Nantucket and Cape Cod inspired me to make lovely shops and houses with woodsidings. Victorian greenhouses, old english pubs and even a Vicrorian Railwaystation. Be sure there will follow a lot more on regular base. Last edited by elin egoyan on Wed Apr 24, 2019 9:38 pm, edited 7 times in total. I am happy to announce that four greenhouses are available on Kitely Market. 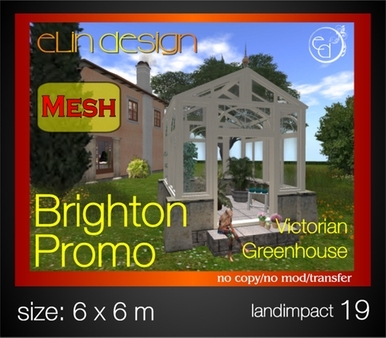 Lovely builds inspired by RL victorian greenhouses. Al in Mesh. In order to make you acquainted with those greenhouses you can 'purchase' an (almost) freebee for 10 KC and see how lovely and detailed those builds are. Re: Shopity Elin Design is a fact at Kitely Market & new releases! After building the Charleston Shops it was a small step to create some more casual shops, you can find at boulevards and harbors at the Eastern Coast of the US. I am happy to have these available for you now. The Eastern USA coast is studded with picturesque harbors, windy beaches, fantastic dunes and flashing lighthouses. The villages are filled with numerous architectural gems - with weathered roofing - houses of whalers, chowder stalls and fancy eateries along the boulevards. That was my inspiration to build a brand new line of shops with pastel-colored sidings. There are 6 shops available in different sizes. As A MUST SEE there is also a Coffee Bar which is fully equipped. Pastries, cakes, muffins, cupcakes, cookies, bonbons, bread roles seats and tables (animated) counters, cups & saucers, plates, cash register, decoration on the wall and tables & chairs with several sitanimations. Amazing to see how natural and real it all looks. 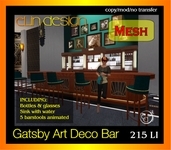 Although the whole build counts, because of these ultimate decoration more landimpact then usual, the bar is mod/copy, so you can take back items in your inventory. 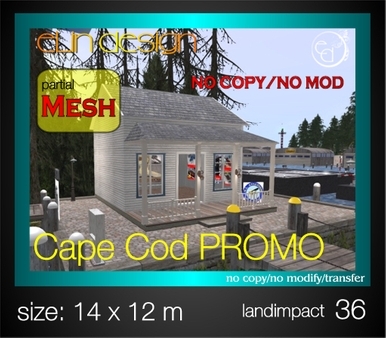 To show how nice these Cape Cod shops turned out to be, I offer you a little promo shop. This shoppe is an advertisement item for promotion. However you can delete all information signs (of course after you have read them ) and after that, start decorating it with your merchandise. What a nice gesture. Thank you. The first houses of Shopity Elin design are released !!!! When you see these lovely Haciendas, I bet you can’t resist them! 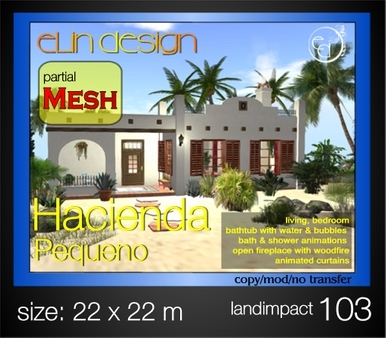 The design is based on a mixture of a Mexican hacienda but with Mediterranean influences. If you sit in the living room, lounging near the open fire or relaxing on the little porch gazing over the sea, you dream of a place like this in Real Life. The details and decoration are so natural that after a few minutes you don't even notice, that you walk around in a virtual world but in the real world and you will feel directly at home. Curious??,... well take a look at my store at Kitely Market and see for yourself! 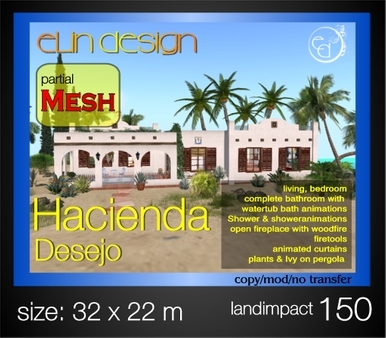 In future there will be also 2 larger haciendas available but first,..... I am going on a well deserved holiday!! After a well deserved holiday I am back in town and I am happy to present you a cute little Victorian Railway Station. This Victorian station or halt will be an enrichment for your railroad. You can use it as a stop in between or also as a stop in the city environment for a trolley or bus. 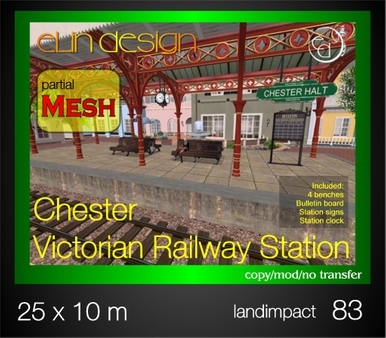 The design of this station is based on the platform of the station in Great Malvern in the UK. You will find this product in my Kitely Market Store for just US$ 3!!! 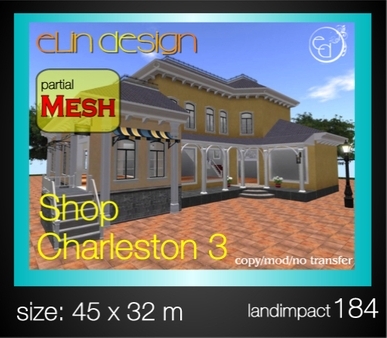 And again I am happy to present one of the most populair shops in the Charleston series! The design of this lovely shop is based on a mixture of a Victorian, Edwardian and Southern US style houses and shops. After building the Charleston Rainbow Row series I just was not ready with all the ideas for shops in that style. The shop has a footprint of 45 x 32 m and has a land impact of 184. But this amount can change when rezzed in other grids the Kitely. This multi functional shop has two areas which you can easely seperate so you can have two different shops in one building. Both areas have a frontdoor. with shopsign. The larger area has 2 floors to display your merchandise. A roomy easy to walk on staircase brings you to the second floor. Some display counters and ceiling lamps are included. OH MY!! The GATSBY time is there!! The roaring thirties of the twentieths century,... The Great Gatsby, Art deco, dancing the Charleston or listening to slow midnight jazz, nipping a Martini,... it certainly was a peculiar time! 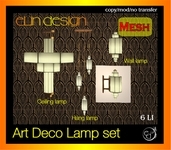 For those who are seriously addicted to Art Deco there is now a range of new products available on Kitely market. This club breathes the real Gatsby atmosphere, which doesn't mean that you can't listen there to heavy metal or hip hop ) In one word, a perfect place to hang out with your friends. Fully furnished with a bar to drink your Martini or something else. You have a choise of a range of drinks. But,.. don't drink to much!! There is an animation in the barstools to tell you had enough! The stage has stage lights and a microphone en in the couches you sit comfortable to listen to the music. 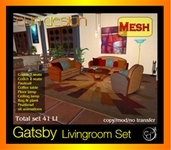 You love to have your house decorated in this facinating style, just grab a livingroomset. Teal and Sand you can choose, but if you rather like to have another color just drop me a line and i can see what I can do. Three different types of lamps in this package. A ceilinglamp, also very nice to decorate your shop. The fissure and the wall lamp. Sooo runnnn to my Kitelyshop and see for yourself!!! 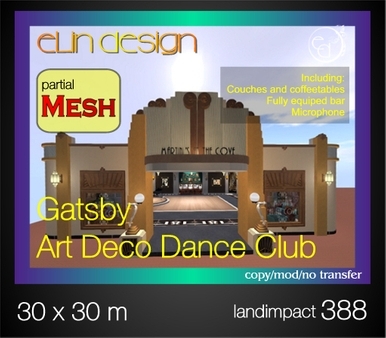 As promised today the release of the Gatsby Art Deco Ballroom,... a building that will appraoch the ballroom of your dreams! Fully furnished with a bar, seats & sofa's diningtables, plants, fountains etc etc etc. This ballroom breathes the atmosphere and the grandeur of the rich. You can dance under the glass roof seeing the stars, the stage invites for famous performers to entertain your guests. The well known Art Deco style you can find every were. Not only in the ornaments en paintings on the wall, but also in the pillars, railings and tiles. In one word, a perfect place to have a romantic dance, or lounge with your friends. 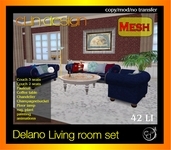 A nice livingroomset with not only with the seats and table but extra a painting, floorlamp, plant and candalaber. You can choose from 4 colors. At the diningtable you can sit and eat from poshy tableware. There are several eat animations in the chairs. Well were are you waiting for? Hop to my shop at Kitely Market and see for yourself! A lot of pictures to see to give you an impression.